The Arlington Education Foundation works to support and advance public education in Arlington, Massachusetts. We fund system-wide initiatives and creative new projects to enhance the educational experiences of Arlington’s teachers and students. AEF awards grants at all levels of Arlington Public Schools – Menotomy Preschool, all seven elementary Schools, the Gibbs School, Ottoson Middle School and Arlington High School. The Arlington Education Foundation was incorporated in 2010, but the history of supporting public education in Arlington goes back many more years. In 1991, a group of Arlington residents founded the Arlington Educational Enrichment Fund (AEEF) to fund innovative classroom projects. In 2001, another group, the Arlington Schools Foundation (ASF), was created in response to the Arlington Public Schools’ strategic plan to make schools eligible for private grant money. For many years, AEEF funded individual classroom projects and programs while ASF focused on system-wide improvements. Although the two foundations’ specific programs were quite different, both were dedicated to supporting Arlington’s teachers and students, and to improving the Arlington Public Schools. In 2010, AEEF and ASF merged to become the Arlington Education Foundation. AEF and its predecessors have always been entirely volunteer-run 501(c)3 organizations, solely supported by individual donors and business sponsors. In its first year, AEF granted $67,420 (seems small now, but it was a big deal then!) for programs and projects in the Arlington Public Schools. Over the following decade, AEF grew its number of donors and business sponsors which allowed AEF to have a larger, broader impact and enhance the quality of public education in Arlington. In recent years, AEF’s annual budget for grants of all levels exceeds $100,000 with support from over 1,000 donors and 40 local businesses. Today, every public school in town benefits from AEF’s work. Each year AEF awards Innovations in Education grants, Development and Expansion grants, and Continuing Scholar Awards. Every 3-5 years, AEF also awards a District Investment Grant: a multi-year, district-wide grant to support the Arlington Public Schools in a larger educational endeavor. In some years, AEF has run a targeted fundraising campaign above and beyond its annual fundraising goals. For example, in 2011 AEF sponsored the Bridge the Gap Campaign which raised over $600,000 to save teaching positions and programs in the face of drastic town budget cuts. 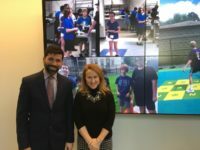 Similarly, between 2012 and 2015, AEF raised $190,000 for a Technology Initiative in order to accelerate the use of technology at Ottoson Middle School and Arlington High School. With ongoing community support, Arlington Education Foundation will continue to grow and thrive so that our public school teachers and students can do the same.